Over the weekend, DC's Dan DiDio showed off some covers from upcoming issues of The New 52: Futures End, in which "Blood Moon" Brainiac was seemingly shredding time and space, revealing looks at numerous pre-Flashpoint versions of DC heroes and villains. 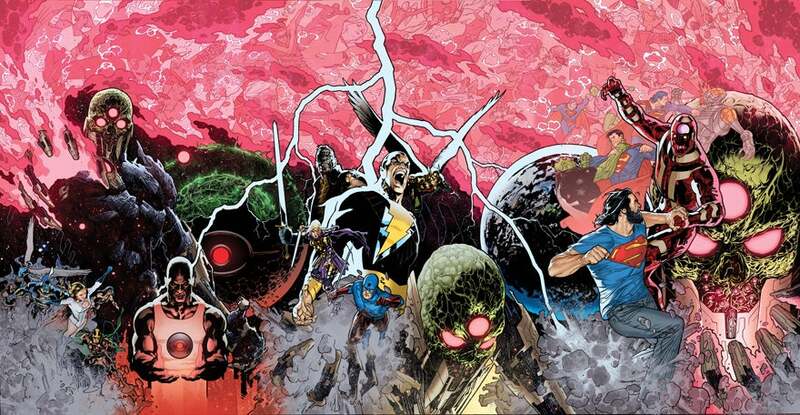 Those covers represented two thirds of an interlocking image that culminates with Futures End #25, and shows numerous different versions of Superman battling it out with numerous different versions of Brainiac. The version from Geoff Johns's Action Comics run appears to be fighting the "standard" pre-52 Superman, while a version that resembles the pre-Crisis on Infinite Earths "robotic" Brainiac battles someone who looks like the Superman from the mid-'90s after he came back from the dead and had long hair (complete with the Byrne-era "S" sigil). 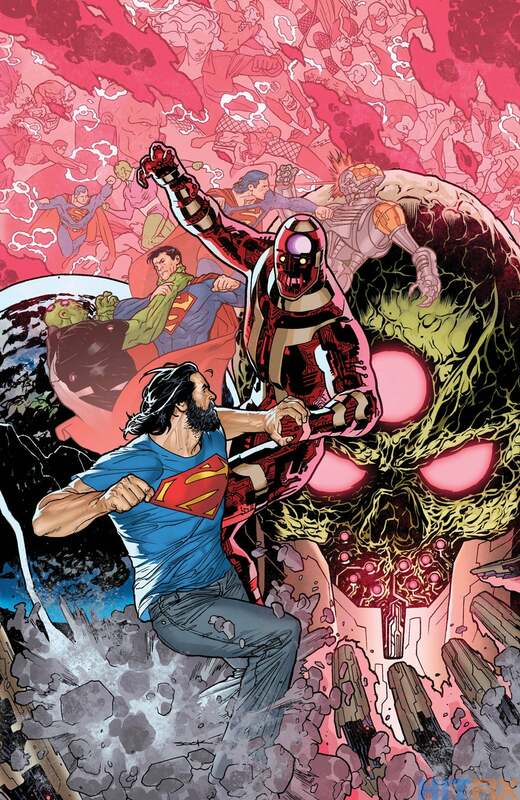 In the foreground, a long-haired, bearded version of Grant Morrison's proto-Superman from the New 52 Action Comics series is battling a fearsome robotic Brainiac while in the background, an iconic Superman fights the "classic" Brainiac from his earliest appearances. All the while, we're treated to yet more pre-Flashpoint characters hovering in the aether. Let's see: Booster Gold, Ted Kord/Blue Beetle, Green Arrow, Black Canary, Big Barda, Metamorpho, Black Lightning, Hal Jordan/Green Lantern, Plastic Man, Lightray, Orion, Lobo, Jim Balent's Catwoman, Martian Manhunter, The Demon and...another Superman. The reveal was made over at Hitfix, along with some context and commentary. The New 52: Futures End #25 is due in comic shops and online on October 22.